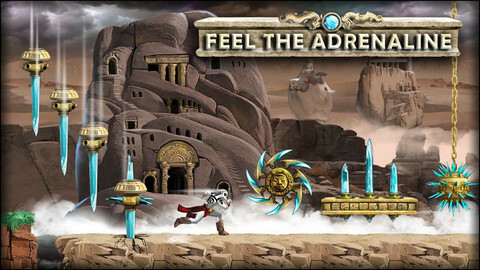 Tribal Quest is an iPhone game developed by HolosOne.This stunning game is a side-scrolling platformer with a dash of endless runner. 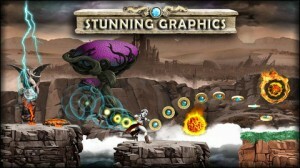 It’s somewhat similar to games like Robot Unicorn Attack or Temple Run. The game takes place on Holos Prime, a planet ravaged by war and populated by vengeful tribes with only one goal – survival. You must jump, roll, and dodge your way across a dangerous landscape, collecting gems and totems along the way. Your muscular, white-skinned character looks a lot like Kratos from God of War, while the level design owes a lot to Robot Unicorn Attack. If the idea of Kratos jumping from ledge to ledge while Erasure’s 1994 hit “Always” plays in the background doesn’t get you laughing, I don’t know what will. I wish Tribal Quest would let you play your own music (like Erasure) during gameplay, though the existing background music is suitably epic. On each run, you’ll be given a variety of goals and tasks to accomplish. Avoid blazing suns and deadly lava pits, complete these missions, and you’ll be on your way to glory. The graphics are solid, and the gameplay is totally addictive. The control scheme couldn’t be more simple. Tap left to jump, tap right to roll into a ball and gather coins or slide under obstacles. The simple controls mean that you can just focus on the gameplay, which is nice. With tons of quests, great graphics, and responsive controls, Tribal Quest is one of the most enjoyable mobile games I’ve played this month. 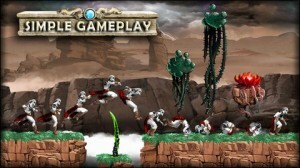 If you love platformers or runners, don’t miss this great game. 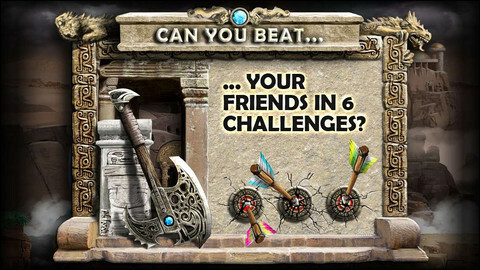 Tribal Questis compatible with iPhone 3GS, iPhone 4, iPhone 4S, iPhone 5, iPod touch (3rd generation), iPod touch (4th generation), iPod touch (5th generation) and iPad. Requires iOS 6.0 or later. This app is optimized for iPhone 5.